Scuderia Dinton is moving into new territory, quite literally. A former builder's yard is being converted into an orchard garden and garage. The majority of the rubble has been cleared from the site mechanically but to make the ground suitable for planting it all has to be dug manually to remove the remaining half bricks and lumps of concrete. After a few square yards had been turned over a large bit of stone showed up which couldn't be moved. Digging around it showed that it was about five feet long. More digging exposed most of the stone. It appears to be some sort of boundary marker or bollard, it was probably part of the adjacent barracks that once included part of the plot. The base is square and approximately 14 inches per side. It tapers towards the top and the corners are chamfered to make the top part octagonal in section. The first attempt to lift it was by levering it up and filling underneath, this soon proved to be hard work, boring and impractical. 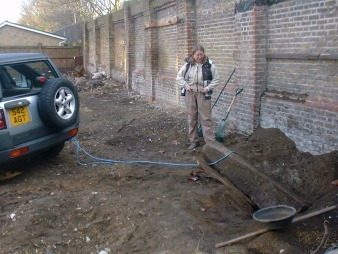 A more amusing approach was to try dragging it out of the hole with a car. The car did the trick. 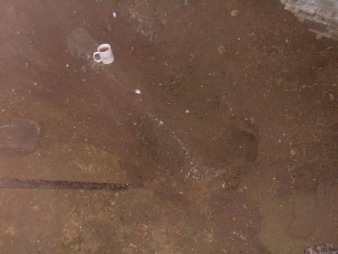 The rope groaned, the tyres gripped and the pillar was lifted so it was half out of the hole. To get it all the way out needed a bit of repositioning to get a straight pull, but once moving it took little effort. 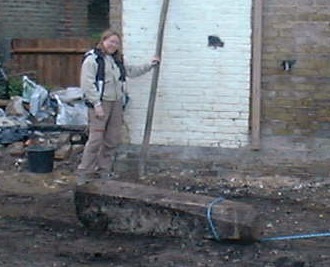 Sarah demonstrates Bollard Surfing, part punting, part water skiing, part masonry. 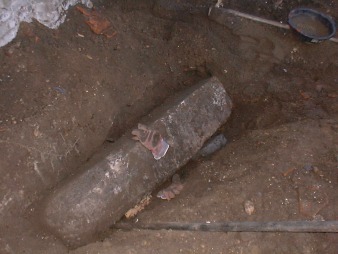 The pillar will be used a feature in the new garden. So far about 8 square yards have been dug over, since the plot is about 240 square yards will we find another 29 bollards? So you've got your huge lump of stone, how do you decide what it is? What the kids who will be wearing out the streets will be wearing out on the street. Will the pick, fork, rake method last the course?